Last week we spent a couple of articles looking at the interesting price phenomenon that we are currently seeing in lamb markets. Strong prices continued last week, in the face of strong supplies, so today we take a look at the export data to see where the extra lamb is going. Meat & Livestock Australia seem to be having some issues getting slaughter data out of some NSW and Queensland plants, and as such we are currently being denied total weekly slaughter data. We do know, however, from what we can see in Victoria and SA, and saleyard yardings, is that supply remains stronger than last year. Prices remain around 600¢ for lambs, which is similar to last year, but it was this week in 2016 that prices started their seasonal dive. 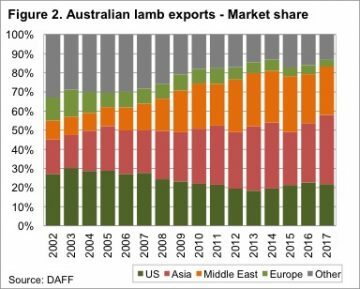 Figure 1 shows that the extra lamb supply we have seen hit the market since June is being soaked up by export markets. The increase has been diminishing, with September exports sitting 13.4% above last year. The three month total increase for July to September is 25%. Interestingly lamb exports for the last three months are not a record, falling just 0.75% behind the levels of 2014. 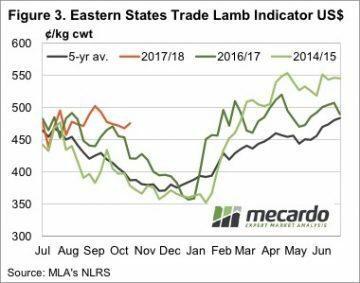 A simple indication of increased demand is the fact that in 2014 the Eastern States Trade Lamb Indicator (ESTLI) averaged 459¢/kg cwt from July to October. This year the ESTLI has averaged 604¢/kg, 31% higher. Pinpointing the source of increased demand is a little difficult. Lamb exports for July to September were up 38% to the US, 21% to the Middle East and 36% to Asia. These three destinations have accounted for 83% of lamb exports for the year to date (figure 2), so it’s safe to say demand is up in all our major markets. It’s also not exchange rates driving stronger demand from export markets. Figure 3 shows the ESTLI in US dollar terms, and while it’s not at record highs, it hasn’t been this strong at this time of year since the very tight supply of 2011. We are left with the fact that all our major lamb markets are buying more lamb, and seemingly paying more for it. This is the key indication of stronger demand. 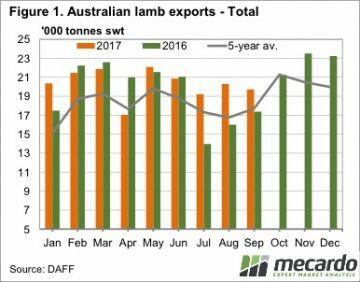 We have in the past seen significant jumps in lamb demand from exports markets, and we might now be seeing early indications of the next one. Significantly larger export volumes, coinciding with similar or stronger prices suggests that consumers in the US, Middle East and Asia have become comfortable with the higher lamb prices seen over the past nine months. This bodes well for future lamb prices, as increasing supplies are unlikely to push the market as low as it got last year, with a 550¢ floor a possibility.